1. Happy International Dance Day in advance! Visit our blog the 29th of this month to read the message by Sidi Larbi Cherkaoui! Diana Betancourt is one of the privileged attendants to the David Zambrano's "50 DAYS/Costa Rica 2010" workshop. I guess all of you who saw the trailer of this event in the web had such a huge curiosity as me about how it was and what David Zambrano proposed at the occasion. Well, this month I was lucky enough to have a meeting with Diana, thanks to her visit to my city and a workshop about the topic that she offered to our dancing community. When I knew she was here, I run after her immediately and got an interview that she accepted generously and full of energy. So, here it is: a testimony and description of the 50 DAYS workshop, as one of the dancers experienced it. It gave me a really greater understanding of Zambrano’s method and insight. I hope you enjoy it! Contemporary-dance.org: How would you define Flying Low and Passing through? Diana Betancourt: Flying low is a contemporary dance technique that works over energy. More than the shape of movement, it is about its energy and the interconnection of oppositions. You work with the totality of the body and do exercises over the ‘bringing and sending’ or the ‘here and there’ or the ‘me and you’, for example. It also has the quality of going in and out of the floor and it is through that constant flow that you recharge the energy that goes through you. The body is understood as a unity and space as part of it. You use this technique to prepare the body. After this there’s the Passing through; this one is a method for improvisation and instantaneous composition where the body is understood as a network that is interconnected with space and the other bodies, including their thoughts and feelings. CDO: Many dancers in the world saw the videos about the 50 years event in Costa Rica… I’m so curious about how it was… What were the exercises and how were them? What were the guidelines that David Zambrano gave you? DB: It lasted fifty days, working from Monday to Friday. CDO: So, you were there for ten weeks? DB: Yes, ten weeks from 8.00 a.m. to 3.00 p.m. The routine was to do a Yoga class from eight to nine a.m. It was a very static Yoga, like for reaching positions, sustain them and breathing. The class was given by a South African dancer that came to the event. There were dancers from all over the world; that is a circumstance that he used a lot during the process. CDO: So during the two hours you made short exercises? It was all executed very fast. We also studied the exercises at a slow pace but not too much. The goal was to go as fast as we could without forgetting any part of our body or the others. CDO: He proposed something like improvisation guidelines? CDO: Did he use to stop during those sessions to change the guidelines? CDO: And how were the guidelines? Did he asked for running, for example, and that was it? Or was it like several guidelines together? DB: He used to combine like three options at the same time. For example, walking, running and stopping. That was the simplest one and that’s how everything began. But there was a deep rule underlying the whole thing which was that everything had to have a curving shape and that the spiral was the source for all movements. The spiral is actually the basement of all his technique. This comes from the idea that everything is curve or circular in nature, rather than straight. So, by applying it we achieve an ‘organic’, ‘closer to nature’ state. CDO: Walking, running and stopping for three hours during five days? CDO: He applied new guidelines to it? DB: Yes, new guidelines over the same main topic and after one week we would change the theme. The next week we did pushing and pulling, for example. There was also a work over the sudden making of decisions. He made us improvise and gave signals to change our energy and shape in a very abrupt way. CDO: Did you use to do like an improvisation round for all this? DB: It was not a round like in contact improvisation, but we were rather all in space and you would enter and leave as wanted or needed. He asked us to pay attention to the instantaneous composition we were producing, both with our bodies and in relationship with what the others were also doing. CDO: So, could you be just observing if you wanted? DB: Yes, but actually everybody was very active and dynamic. CDO: And did he construct something through the whole process? Like a performance or a choreography? CDO: So for the ten weeks you maintained that routine of Yoga, Flying low and Passing through? DB: Yes, but there was something new every day. We did a lot of games and thinking about what we were doing. I guess the main topics behind everything were the spiral, the relationship with others and the non violent movement; it was about being strong without being violent. CDO: Are there contact exercises in his proposals? DB: No. He even joked about contact improvisation because it is different form his work in its constant relaxation, giving state and softness. Here we were in the search for a very dynamic, interchangeable, awakened and energetic flow. Very much awakened, with opened eyes all over the body. David always danced with us; that was really beautiful. He was always there, with his fifty years, with a wonderful energy and in relationship with all of us. He was the master, but he was moving with you. So the teaching happened like in a more horizontal way. CDO: How is his relationship to music? DB: He always accompanied the exercises with music from an iPod and of all types. Sometimes he used jazz, sometimes rock, folk, pop; it was really all kind of it. He said it depended on the energy needed. CDO: But was the movement rhythmically coherent with the music or was it more like a sounding background? DB: He greatly believes in the connection between music and movement but he doesn’t count. You feel that what you do is coherent with music but it doesn’t go like a five, six, seven, eight thing. He also creates some kind of a song that translates the actions that you are executing and affirms that if we sing what we do, we find a special honesty with our selves. So doing the Flying low exercises with their songs was one of the steps of their practice. He did indeed make us experience the silence or unusual soundscapes sometimes, but he actually made us hear an extremely wide spectrum of music. CDO: All this sounds like a really hard work. Ten weeks, six hours a day, almost none stop. How did you all bear this? DB: Well, the class charged your energy but at the end we were all really exhausted. There were hurt people as well because we were all very enthusiastic and tried things with excess of energy. But it was not tedious at all because there was always something new to learn. There were a few less interested dancers towards the end but it was not my case at all. CDO: Is there something in particular that you would highlight about the teachings of David Zambrano? 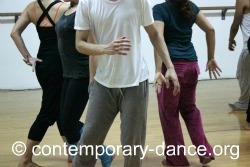 Choreographer and dancer based in Costa Rica since 2000. Diana is born in Colombia where she dances with Sabine Stockman and Claudia Cadena. In 2000, she travels to Costa Rica to attend contemporary dance studies at the school of the National University. Afterwards, she graduates from the conservatory EL BARCO at the ‘Taller Nacional de Danza’ directed by Jimmy Ortiz where she has the opportunity to learn from masters like Juan Cruz, Joelle Bouvier, Dominique Mercy, Lutz Foester and Roberto Olivan, among others. Since 2008, Diana directs the ‘Grupo Alternativo de Danza Contemporánea Danzú’ which is made up of students of the University of Costa Rica. Each year she creates choreographies that are based on the study of human nature: PARAISO CON LENGUA (2008), DELICIOSAS RELACIONES(2009), ENTRE PIERNAS (2010), CENTRAL (2011). As her graduating project she dances and directs ES (2011), which is a short exploration of the subject of the relationship between man and mother. After her participation at the "50 DAYS/Costa Rica 2010" workshop, she is compelled to share Zambrano’s dynamic wisdom. She has developed her work with pregnant women, mothers and babies, the elderly, teens and dancers. The main motivation of her teaching and artistic work is to share creative possibilities through organic movement, without tension but with attention.